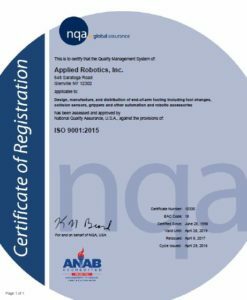 Applied Robotics | Robotic Technology | Robotic End of Arm Tooling | Solutions in reach | Applied Robotics, Inc.
ISO 9001:2015 sets out the criteria for a quality management systems. International Standards bring technological, economic and societal benefits. They help to harmonize technical specifications of products and services making industry more efficient and breaking down barriers to international trade. Conformity to International Standards helps reassure consumers that products are safe, efficient and good for the environment. Download copies of our certification below.